I am at a point where visiting a shrine or temple is no longer a fascinating experience. After a while the minor ones just all seem the same – seen one seen them all! This is the result of 3 trips I did that focused mostly on viewing shrines, the first one was just wandering around the dorm, going to the closest temple and then finding there are many more in the vicinity. I saw them all and they seemed very interesting and mystic but that was probably because I was visiting them at night and felt I will probably end up cursed by the time I get back home. The second was a trip to Kamakura and Enoshima, Kamakura was the capital of Japan during the appropriately named Kamakura period of Japanese history and because of that it’s full of history and impressive, large temples and shrines. During the third trip to Nezu and Yanaka – the older parts of Tokyo that were not destroyed during world war two or by earthquakes – was when I started to see the ‘not another temple’ sentiment build. Some of the following statements may be not quite correct and anyone interested should look at more credible sources. Shinto is the indigenous Japanese religion, mostly focused on celebrating life. 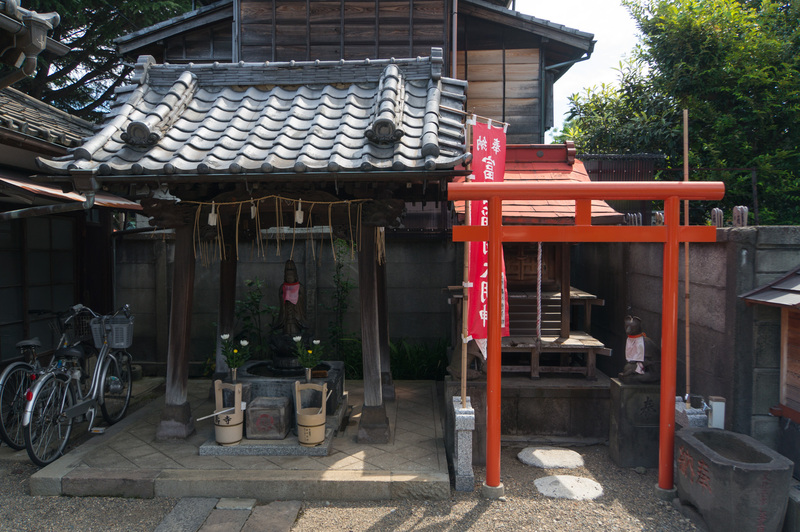 Shinto shrines are usually built to house sacred objects that hold parts of the gods (kami) or next to sacred mountains or trees which are also a connection with the gods. Shrines are characterised by different barriers that separate a holy place from the rest of the world, the most famous examples of these are the large gates – torii – and the guardian lion-dogs, the komainu (example below). The most sacred building of a shrine (the main hall – honden, where the kami is enshrined) is not accessible to the public, it is usually connected to another hall – the hall of worship, which can be entered. Another important part of a shrine is a basin with water where visitor purify themselves before entering. Buddhism arrived to Japan from China and ended up being incredibly influential throughout the history of Japan. Different forms were more prevalent at different times, one of the more famous ones to people outside Japan is the Zen Buddhism, which became very popular during the Kamakura period. In Buddhist temples the big halls that house the Buddha(s) are usually open to the public, they are large and have very prominent roofs. The temples also feature large gates (mon) through which a visitor must pass to get inside and to (in some cases) purify themselves. Some of them feature protectors of the Buddha like the komainu or other angry gods. The famous pagodas and large bells are also features of Buddhist temples. Listing the features of temples and shrines would leave visitors confused when they started seeing features of shrines in temples (such as torii and purification wells), they would also be surprised to find that some shrines enshrine a Buddha. This is the result of more than a thousand years of melding and blending of both religions, which as far as Japan is considered shouldn’t even be considered separate in the sense Europeans usually view different religions. Japanese people go to Shinto festivals (matsuri) and visit shrines (and also temples) on New Year’s Day. They get married in the Shinto tradition and buried in the Buddhist one. It’s therefore no surprise that the temples are also a big mixture of features, that makes them all the more interesting to explore! The following photos are from around my dormitory and the Nezu-Yanaka-Ueno trip. I don’t think I ended up cursed but I did end up a bit tired of temples and shrines by the 20th one. We all did. A night shot of the Oto shrine, closest to my dorm. Another of Nezu’s many temples, check google maps, there are more temples and graveyards than haouses! The next photos are from a trip to Kamakura and Enoshima Island. I visited the top 3 most important Zen Buddhism temples, Kamakura’s largest Shinto shrine, the Daibutsu, and explored a few other paths that resulted in the discovery of a tengu shrine. Tengu are Japanese mythological creatures that reside on mountains and are usually depicted with long noses. I have always found them interesting so finding a shrine devoted to them after quite a walk up numerous stairs was a very nice reward for exploration. I was also able to witness a Shinto ritual being performed by a priest and participated in a traditional tea ceremony. At Enoshima Island I learned the temples are mostly devoted to couples and that is quite evident when most of the visitors are couples trying to get some divine help with staying together. I didn’t end up seeing Mt. Fuji from the top of the observation deck but I did see a supposedly rare statue of a naked water goddess! A look back on Enoshima island. Luckily Japan is still packed with national-treasure level shrines and temples, I look forward to visiting places like Nikko, Kyoto, Nara, Miyajima Island, Koya Mountain, and many more. Most of this post was written about two weeks ago but never finished, that was when I felt quite sick of holy places. Since then I have actually visited Nikko and had a very up close experience with a festival at the neighbourhood shrine. I also plan on looking into the commercial side of shrines and temples, they seem quite an industry! Next time!